The Twain Shall Meet: Harper to Replace Auditor General ~ Another Piece of the Puzzle? 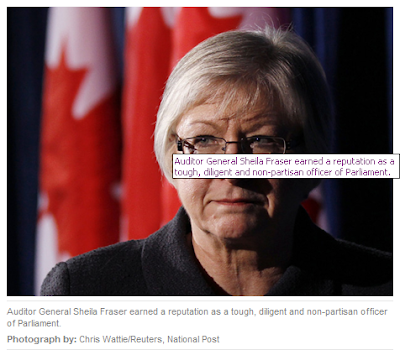 Harper to Replace Auditor General ~ Another Piece of the Puzzle? Sheila Frazer's ten year tenure as auditor General is drawing to a close. Appointed in 2001, she has been a well respected and respectable presence. She raised the initial concerns that led to the Gomry Inquiry and has always been seen as a non-partisan and balancing force in her position. Her job will end on May 30th, 2011. Harper's majority in the House will give him a free hand to fill the position with a person of his own choosing. Although the end of her term is but three weeks away, not a hint of who that person may be has reached these ears. You will excuse me if I am made nervous by the prospects. She has already finished writing her final report, which includes chapters on the contentious issue of how the Conservative government spent tax-payer money on the G8 and G20 summits in Ontario last June. It includes, according to leaks, a scathing analysis of the Spending in Tony Clement's riding (known to have been in excess of 50 million dollars) and the origin of those funds. "The report was supposed to be tabled in Parliament in April but was delayed by the election and won't be released until the Commons is in session in June — after Fraser's departure." That of course is ^NOT exactly true, as it was really stopped in it's tracks before the Contempt charges were laid. It was a result of NDP MP Christopherson's vote in the committee. This is skirted entirely in the article quoted above, even though Christopherson's opinion on other matters was widely quoted. “Liberals Want Canadians to See the Auditor General’s Report – but Mr. Layton’s stunt of calling for a meeting with the Auditor General took some nerve after his party blocked the report’s release before Parliament was dissolved,” said Mr. Volpe, Chair of the Public Accounts Committee in the last Parliament. “If Jack Layton and David Christopherson had their way, voters would never know that the Conservatives spent nearly $50 million on G8 projects with no controls and without Parliament’s approval – and they missed their chance to expose this waste, abuse and contempt before the election by siding with the Conservatives to bury this report. As we launch, or rather plummet headlong into this new Harper Majority, keep your eyes open, and let them know that you are not someone to be counted among the somnambulatory majority of Canadians who helped allow this situation to get this far. You should be easily identifyable as part of this group if you woke up Tuesday last and were feeling even a bit satisfied with the election result. I Worry that Our Prime Minister has ^NOT exactly made a habit of making decisions that could be seen as non-partisan, open and transparent nor has he gained my trust in the Five long years since these appointments have been his to make. He has appointed a record number of Senators, to a Senate that he promised to make an elected body. He has dabbled in any and all positions that he could turn to his advantage. How much of Canada will remain free from his control? hard to say, but this appointment may very well set the tone. So, remember Mike Duffy. Remember Bill Elliot. Remember Christianne Ouimet who managed Over 200 files with no results. Remember all of the Contempt, and remember that it is now very likely that none of it will ever be dealt with. Remember the 2006 election, the Prorogations, the still Secret Afghan detainee Documents, the Guergis affair and the Countless other Deep Democratic Concerns. Remember that Harper is ^NOT Teflon. Remember that He is Proactive and Preemptive. Somnambulate at Your Own Peril. God I love watching liberals sooking...and sooking...and sooking....get over it...your leader wanted this election....he caused it...and where is he now...NOWHERE....just heading over to the UoT...he could have left the government continue...had the G8 report...the afghan report etc...and you know maybe even some ammo for Harper's defeat...but Oh no...let's go now....you caused it and LIVE WITH IT NOW CRY BABIES!!!!! God I love getting anonymous Comments from weirdos. It took all three Opposition parties to engineer this election, and as you would know, had you read all the links above that Jack Layton was responsible for withholding the G8 Report. If you were Not so dense, you would also know that No one could have voted for the Budget. Jim Flaherty is a Flake. And also, if you were the type to do a bit of research, you would already know that Harper is about to pass a law that makes it illegal to comment anonymously while giving misinformation. I guess he will have to lay off all of his dull witted Astroturfers as well. I say "dull witted" which should serve as a hint that "sooking" is not a real word. We all lost this election. I am not crying about it either. I am just recording the facts to help bring down this loser with the ammo you kindly mentioned above. One other little tidbit. Michael Ignatieff is about to teach in the University that Stephen Harper Flunked out of. How Cool is that? Thanks for being 'annoyingly and anomalously anonymous' You really helped to make my day. Enjoy yours! If you were Not so dense, you would also know that No one could have voted for the Budget. It did ^NOT and still does ^NOT add up. It has already been announced that the projections are wrong on the 11th of March. Jim Flaherty is a Flake. One other little tidbit. Michael Ignatieff is about to teach at the very University that Stephen Harper Flunked out of. How Cool is that? Thanks for being an annoying and anonymous anomally. You really helped to make my day. Harper didn't flunk out of it...just did not like the BS...so went to a real one. It was the libs...little scotty brison who made the motion...and it looks good on all of them...I hope you are as successful defeating Harper as you were with Goguen...could not even keep an incumbent in Moncton...dream on pal! 'John' is exactly one juvenile step from anonymous. We all know that Harper did flunk out of it, unless you are just sychophantic enough to believe a 'December Graduation' is still a graduation, or that a 'December Graduate' is a Graduate. The Dream lives on Johnonymous! It lives on. You are right, though I could not save the local Liberal, but will have to turn my attention to the new man in Town. Sometimes it is OK to have a man around like Robert Goguen. ESpecially when over 60% of us understand enough about Neo-cons to wish that he was Not our MP. So, yes, the Dream lives on in Moncton, but unlike last time, when there were no flashmobs, protests or confrontations, that is quite unlikely this time around. They are saying that oguen was an activist. Is there such thing as a Conservative activist? I shudder to think what you Johnonymous, would be willing to fight for. Higher Corporate taxes? Bigger Deficits? Less information? Bigger more expensive Gazebos? It is quite obvious that I am not your pal. I was thinking I might feature you in a new blog post. (I have other more interesting comments from you that are not yet moderated). Why not take the time to fill out your profile in Blogger? Lol! p.s. I went to school with a guy named John. Oh My God, John, is that you?